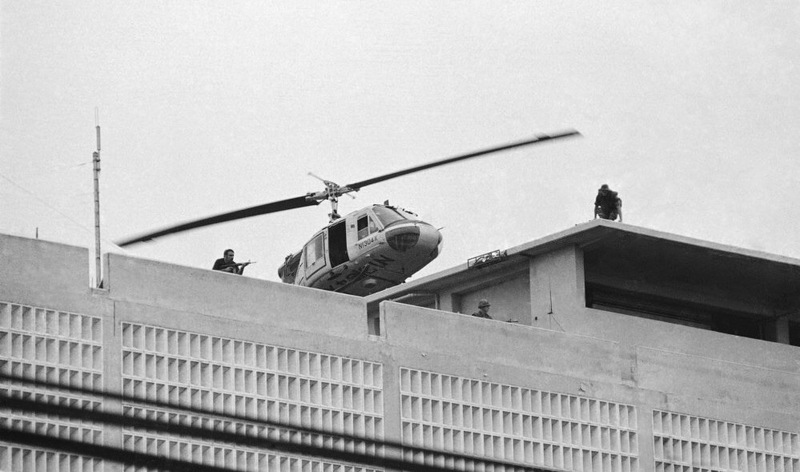 Perhaps you’ve seen the photos or video of the United States’ evacuation of our embassy in Vietnam in 1975 as the Viet Cong overran South Viet Nam. It was a great disgrace and embarrassment to the United States to have, in effect, lost its first war, diplomats and soldiers and civilians squeezing into helicopters on the embassy roof and even dangling from its underneath skids; but it’s a suitable metaphor for how many Christians today see the church in relation to culture. The church is God’s embassy in an increasingly hostile culture that it can never hope to recapture for Christ the King. The best we can hope for is to win over a few of the locals to our otherworldly Gospel. As time goes on, even that influence will wane, and in the end, like Saigon’s U. S. embassy in 1975, we’ll dispatch diplomatic buses to collect our citizens and their friends for the final evacuation. From the embassy rooftops the divine helicopters will rescue the faithful and take them to safety on God’s heavenly aircraft carrier — this is sometimes called the “rapture,” or thought to be coincident with the Second Coming. My metaphor may be too dramatic, but it’s not, I believe, inaccurate. This embassy-roof Christianity is strange, because most who hold it also champion the Great Commission, at least in theory: our calling is to get the Gospel to and baptize and disciple all the nations. But it’s not clear how they reconcile the Great Commission with their embassy-roof Christianity. The Great Commission is robust, outward-looking, Gospel-disseminating, culture-redeeming. Embassy-roof Christianity, on the other hand, is insular, inward-looking, Gospel-shrinking, and culture-rejecting. If, as I suggest, the Great Commission is the cultural mandate (man’s calling to steward the world for God’s glory) adapted to the post-Fall world, embassy-roof Christianity simply isn’t compatible with the Gospel. Gospel ministry, as you might imagine, is conceived very differently in these two viewpoints. Embassy-roof ministry gets a few souls saved and into the church. It teaches them (rightly) to live a life of surrender to the Lord — prayer, Bible reading, personal evangelism, resisting temptation, rearing a godly family, and, at best, expanding the church. But even in its church expansion goals, it always conceives itself as fighting a defensive battle. It can’t expect any great revival or reformation in society, any culture-transforming Gospel victories. In fact, the church is likely destined to lose its effectiveness as apostasy engulfs the culture. Ministry is intensive (sanctifying Christians), but not extensive (expanding Christianity). They’re preparing the faithful for that rooftop helicopter rescue operation. But Great Commission ministry is quite different: it plans for victory, to reverse the enemy’s advance and retake the territory presently under satanic control. It takes God’s Gospel promises seriously. Make no mistake: Great Commission ministers know they’ll suffer Satanic assault and setbacks, and that their task won’t be easy, just as Jesus’ wasn’t, but they are buoyed by the confidence that our Lord’s kingdom in human history — coincident with the present age, not only the age to come — will gradually overwhelm Satan and sin in all areas of life and thought. For this reason, Great Commission ministers pray for power to cast down satanic strongholds and all that exalts itself against Jesus Christ (2 Cor. 10:5). They address all areas of life — education, politics, music, architecture, medicine, technology, science, art, theater, cinema, and every other area of life presently corrupted by sin. They encourage Christians to influence society for divine truth wherever God has placed them: selling automobiles, writing code, teaching children, designing or painting houses, making coffee, or leading an international corporation. “[W]here sin increased [wherever! ], grace abounded all the more” (Rom. 5:20b). You can see how different ministry looks when practiced by Great Commission Christianity than by embassy-roof Christianity. Both want to honor Jesus Christ’s redemptive work, but they have significantly different ideas about how that work looks and what its expectations are. Full-fledged Gospel ministry is one of cultural engagement and conquest, not abandonment and defeat. Many embrace excessively pessimistic eschatologies. One of the most influential proponents in recent memory of this viewpoint and its consequently diminished Gospel was D. M. Lloyd-Jones. See, e.g., his 2 Peter (Edinburgh, Scotland, 1983), 81, 231. Roderick Campbell, Israel and the New Covenant (Philadelphia: Presbyterian and Reformed, 1954). Amen! We have deep rooted theological problems in American Eschatology. This is a huge problem. Your illustration is right on. Jesus wants us to be advancing the Kingdom. This Kingdom vehicle is the church. What did He say about the church? The very gates of hell can’t stand against the church. The power of hell has to go on the defense. We are destined to succeed. The only ones who hold us back are ourselves. Jesus will one day return and people from every nation, tribe and tongue will experience glory in eternity. Why is it that we don’t play by the rules when we do End Times Theology (Eschatology)? People want to start with a newspaper article and the latest chart and graph. It has lost it’s mystery. We have taken something that we are told we will not know the day or the hour and we graph it out to the day. We miss use books like Daniel and EZekiel and cut and paste the verses we need in the New Testament. We have become date setters in the church. It is tragic and hurts the advancement of the Kingdom. People are looking at being pulled out of here, when we were made to influence and show the world Jesus through daily love and sacrifice. We were made for this. Bad theology on End of Days things hurts the Kingdom. Great Post! Great article, my friend. The picture is actually not of the U.S. embassy roof, but a neighboring apartment building (this is a common misconception, fitting given that war). Those being evacuated are Vietnamese. That’s correct, Dave. I saw that distinction on the great documentary “The Last Days of Vietnam,” but forgot when selecting the photo.